Kramer is once again exhibiting at the Bauma together with Wacker Neuson this year. With near 6,000 square metres, visitors can expect one of the biggest fair stands in the outdoor area at stand no. FN.915. The large demo area offers the possibility to experience the machines live in their application. Kramer will display a wide profile of its product portfolio in real-world application once again this year, as well as present the new telescopic wheel loader 8145T. Kramer will offer the 8145T with telescopic loader unit and Z-kinematics in the performance range of the 9 - 11 tonnes class. The telescopic wheel loader has a bucket tipping load of 5,500 kilograms, a stacking payload of 3,900 kilograms and an operating weight of 11,170 kilograms. The 8155 in the same performance range is available at Kramer since last year. With a bucket tipping load of 6,100 kilograms and a stacking payload of 4,200 kilograms, the Kramer 8155 model opened up a new size class in the Kramer wheel loader product portfolio. As with all models of the 8-series – Kramer's Premium range – all-wheel, crab and front-axle steering are available as standard. Both machines impress with maximum stability, manoeuvrability and constant payload thanks to its time-tested and proven, undivided vehicle frame. The wheel loaders and telescopic wheel loaders are equipped with high-performance load-sensing hydraulics, the innovative ecospeedPRO (optional) drive and a 100 kW strong Deutz TCD 3.6 engine of the exhaust emission stage IV. The exhaust after-treatment is carried out by DOC and SCR. Thanks to the time-tested and proven all-wheel steering and a steering angle lock of 2x40°, the machines are specialists for heavy loads on confined construction sites. The turning radius of these machines is only 3,865 millimetres. 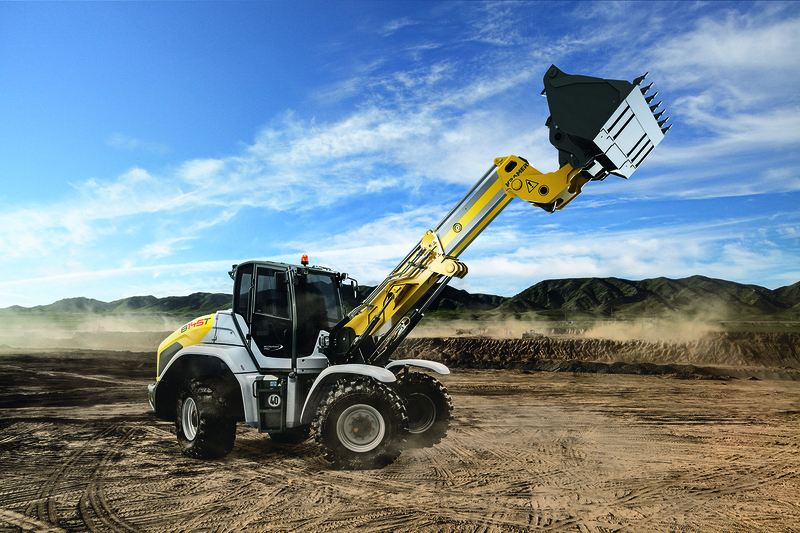 The telescoping loading system of the 8145T expands the full-fledged wheel loader once again by an increased load-over height, stacking height, dumping height and reach. That means: Maximum versatility in wheel loader application with extremely high load-over heights (all tags and lorries can be loaded and unloaded with this loader unit). Beside application areas in industry and recycling, the 8145T can be used for material transport on large construction sites as well as for loading and unloading heavy transport chains and carriers. The different attachments are always perfectly visible thanks to the compact modular design of the loader unit. The Z-kinematics provide higher tearout forces and particularly quick emptying of shovels. Kramer is one of the first manufacturers to present machines that comply with the fifth stage of the European emission legislation as early as 2019 – these include the wheel loader 5065 from the 5-series and the 8095 from the Kramer premium series, both will be presented at the Bauma 2019. These Kramer machines already fulfil the stricter limit values for particulates and nitrogen oxides. With the introduction of the level V in Europe's mobile working machines, the world's highest emission standards are launched. Level IIIB or IV (depending on engine output) primarily regulated limit values of carbon monoxide, nitrogen oxides, hydrocarbon and particulates. Level V mainly focuses on the limit value of particulates. This limit value can be reached using a Diesel Particulate Filter (DPF). Beside the presented innovations, Kramer will also display current models from the compact class, and, loyal to the group motto "zero emission", the 5055e, which won the innovation price at the Bauma 2016, must not be missed. A section of the telehandler portfolio will also take part in the demo show and be presented at the exhibition, among them the two new telehandler 4007 and 4209 models. "We look forward to the Bauma 2019 and the opportunity to present our innovative solutions to our customers in personal dialogue. The stand visitors may also look forward to interactive and action-packed test areas," says Karl Friedrich Hauri, managing director of the Kramer Werke GmbH.